Yeolight Technology (which was spun-off Visionox in May 2015) announced its first OLED lamp, the limited-edition OLED Organic Lamp. The OLED lamp was designed by Qiu Song, an industrial designer from Tsinghua University. The lamp design inspiration came from swan feathers - "with its effortless glide on the mirror of a lake, unfurling flight, this OLED lamp brings us the beauty of serenity". Yeolight will produce only 500 lamps, with the price set at 2,200 RMB (around $325 USD). Yeolight now accepts orders and ships globally. Yeolight has its own 2.5-Gen OLED lighting production line, but at this stage it only produces samples. 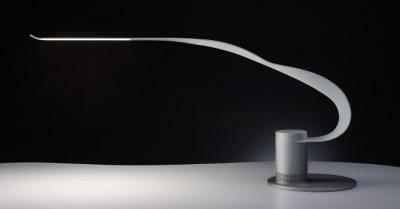 The desk lamp uses OLED panels produced by LG Display. The panels are 200x50 mm in size (thickness 0.88 mm) and feature a color temperature of 4000K, a CRI of over 87, a brightness of 75 lumens and an efficiency of 55 lm/W. The lifetime is 30,000 hours (LT70).